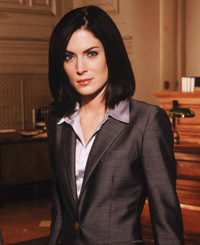 Lara Flynn Boyle is one of the best character actresses in America, who can play any role exceptionally well. The purpose of this website is to showcase her talent as a character actress in TV and in Motion Pictures, which is the real key to Ms. Boyle's success. On this website, you will find information about this talented actress, her rise above dyslexia, and some of her greatest roles in films and on Network T.V. You can also take a Caricature Quiz and win an award. Please enjoy my special tribute to Lara Flynn Boyle and please sign the guestbook before you leave. Lara Flynn Boyle as the villainess "Serleena" in "Men in Black 2."